If you're new here, you may want to download my free ebook ACTION Blueprint to start creating your own products fast! Check it out on the right. Thanks for visiting! If someone were to offer you the opportunity to increase visibility of your business/book by (potentially) billions of views worldwide would you be interested? What if it cost you nothing at all upfront? What if they also offered to do some proven marketing strategies for your book as well? You would be interested right? All YOU would need to do is to write a relatively short book (3000+ words) on a topic that is popular and profitable. OK, you would also need to upload that book to a publishing platform but it still wouldn’t cost you a penny. You would be crazy not to jump at the opportunity! Well, that is what using Amazon kindle publishing platform can do for you and your business. Have you published your kindle book yet? If not – why not? Out Now! 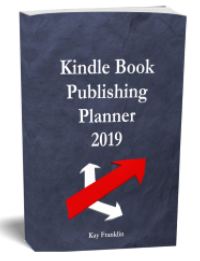 Increase productivity with my new 2019 Kindle Publishing Planner. Keep track of sales and promotions. Or Start Immediately with this undated version. Both include brainstorming tips and ideas on how to increase your profits with existing kindle books. Publish ebook & print books using this free to use platform. Best browser software for checking kindle book competition. Send and schedule your Tweets on autopilot with this free software. The best complete kindle publishing course online. Still regularly updated and great support too. 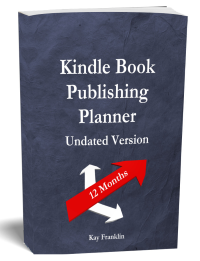 Comprehensive kindle book research software for ideas, competition and AMS keywords. How to set up a UK paypal account to accept dollars? Is Google Docs Voice to Text Function Any Good? I have taken several courses over the past few years about starting your own business, and I have to say, out of all of them, Kay's is the best; and so cost efficient!! So many courses are full of hype and cheer leading, not to mention pages and pages of "Buy More Products" that are all essentially the same thing over and over again. Ms. Franklin's approach is down to earth and she's not afraid to speak the the truth. Don't be put off by her non-flashy site. Flashy means unfulfilled promises and rah rah rah. This is where you belong. Thank you Kay!! I left a testimony once but think it could be taken out of it's context. I am very please and happy with Kay's program. I enjoy getting the emails and everything she does to make sure students have the tools to build their own online business one day. Just been impress with it all! I ordered Kay's materials at a great price and was totally overwhelmed at how much content she is offering in the training course. I am learning so much and hopefully one day I will have my own business online with my own products. For right now, I am grateful to have someone to take me through the process to see how it can become a reality. in the marketing plan. Also your encouragement and accountability is appreciated! I mistakenly thought that creating an ebook for kindle was a simple matter of converting a 'manually formatted' .doc or .docx file to pdf and then converting the pdf to mobi/kindle format, which worked as such, but formatting was not good - I didn't realise you had to use styles for the master .doc/.docx file first. So I'm really glad I purchased your ebook! Thanks. Not only did she help me figure out how to format my kindle books, she was even there MONTHS down the line when I published my book. I had a formatting issue and I emailed her and she was so HELPFUL like she legit helped me fix my formatting error for free. She doesn't just want your money. She is there to help you through your challenges. This is from my heart. Kay is freaking awesome! I will always keep Kay's valuable advice in my writer's toolbox - I could not have uploaded my kindle book without her great book. She has also generously helped me in the process of getting my book into paperback. Thanks Kay! What a learning curve - I have just finished watching all the videos and have learned so much. What a find - and a bargain - and it so exciting to know what to do after such a short time of watching the clear,well presented instruction and taking notes. Everything is here for a writer to set up and get their EBOOK online. Thank you! I first discovered Ms. Franklin's work while writing my own. Her email tips are very useful and not just "fluff" to push out content. More than that, her kindness and personality shows in every bit of her material. I am so grateful for her personal insight and continued supportive attitude and published work. Ms. Franklin is one of those rare souls who truly connects with those reaching out to her; a teacher of teachers. Thank you so very, very much, Ms. Kay Franklin! Kay, you are a star! I've been struggling to get my paper back version onto Kindle for over a week now. I've tried all manner of documents from Word to PDF to HTML, but I just could not get it to display correctly. This template I've just downloaded is going to be the answer to my prayers! Its very similar to one I used for the book so I'm confident now I'm back on track. Thank you so much. Profiting with Information is a really useful, practical and effective set of guidelines and examples that not only got me going with online marketing, but also got me feeling excited about how I can work out and launch what I know. I love what I do and want to 'get it out there' and now there will be no more false starts and confusions. And Kay leaves you nowhere to go on excuses - I'm so thankful for that. I am delighted for the chance to leave some feedback on this video series, as after watching it through I regained a bit of confidence that I could in fact publish an Ebook. There is no fluff or flash when Kay teaches how to do something. I had wasted so much time and money on other products that were mostly hype. Kay takes us through the production of an ebook, covering every possible detail or problem we might entail. Her emphasis is on speed, without sacrificing quality. She starts with finding the proper niche and then the content for that niche, right through to creating our cover and then exporting all to the preferred format, which is PDF. This is a thorough job from an intelligent person who has been there and done that. I am very impressed and pleased that I bought this series and recommend it to anyone who is serious about making money with digital products on the internet. But I don't stop there as there is so much more to learn from Kay, as you will see if you spend some time on her website which is full of wonderful information. Thank you, Kay, for being a very real, star teacher in this crowded and sometimes scary industry called Internet Marketing. A quick note to say thank you... The couple emails and first ebook I read, have confirmed my inner knowing there had to be a more concise way to get my message(s) out there. I am praying all I am learning with your programs, helps me create my own products and financial security, as I bring value and life saving information and truer awareness about cancer to many. ~ Thanks for triggering what I've know it is ready to come out...as I read your Action Plan, my slate is once again hopeful and off to a great start. Somehow, I am seeing beautiful fruition and advancing projects in the near future. Also, we appreciate your kind availability. yours is the only one I have been able to understand. This course is excellent value for money. It came at just the right time, as I had been struggling with how to make products to sell on my website. The 10 x 10 matrix is a brilliant idea, and has given me a good foundation. I have been working on an ebook, articles and a course, but was floundering around not really knowing how to put all my ideas into these products in a constructive and professional way. Kay has put my feet on firm ground and I am now finding this project so exciting. Whereas before hand it was becoming a chore. I have a huge problem with being distracted rather than being productive so wanted to try Kay's course to see if it would help. I'm not keen on video tutorial/instruction as I have a hearing problem and find most video difficult to listen to. Not so this course! The video's are clear, visually interesting and easy to play, rewind, fast forward. Kay has a relaxing, calm voice and the instructions are interesting and easy to follow. Thought provoking too. All in all the course is excellent and has helped me tremendously. I am a therapist and in full disclosure I asked Kay if I could review this product. I am often asked by my clients if I would be able to help them change their lives for the better. And I wanted to check out Kay's Action Productivity Video Course to see if it could stand up to the requirements of "ordinary people" who need to improve their lives in specific areas. Kay's course includes 9 videos totalling over three and a half hours of training. Her system also includes the use of spread sheets, online personality tests and some easy to use productivity software. All of which supplies a comprehensive system that works. I followed the course through from beginning to end and was surprised at the uncannily accurate description of myself that was produced in the personality test results. I also learned simple but effective systems for becoming more productive, breaking bad habits and keeping more focus so that I could more easily get what I want out of life. Being able to do all of that is a pretty big thing to ask. And Kay's Video Course delivers that very thing. To be honest, I already knew of some of the techniques she described, but I can almost guarantee that no matter what your level of involvement is in the "productivity" niche, there are bound to be many nuggets and techniques to use that will make it easier for you to move on in your life. The course actually leans towards the topic of building a successful business, but will certainly work for anyone wanting to change their typical home/ work life as well. Each video starts with a passage of lively music to set the tone of things and then each module is laid out in easy to understand steps that can be followed easily. Kay has built an Action Productivity Course that presents a comprehensive system in an easy to understand progression. I would heartily recommend the Action Productivity Video Course to anyone who wants to fit more into, or who wants to get more out of, his or her life. You can order this course with confidence. I was fortunate enough to obtain a review copy of Kay’s twelve week list building course and I was delighted this was the case ! The guide is written in an easy to read, no nonsense style and delivers quality information which can easily be consumed in step by steps lessons. Kay obviously knows list building and has certainly over delivered to her customers with this guide. I have already asked my outsourcing people to implement some of the nuggets she has included in the guide. By making a decision just to ask if she had a report on TOC in the Open Office Writer and Word. I am a bit surprised when she want to make this report and was willing to help me. Make me overwhelmed. Actually, I've been looking for a report on the Table Of Contents everywhere but was unable to match this report, brief but full of information, it is easy to follow each step given together with the screenshots. I've tried what was taught in the report. As a result, I can now make Clickable TOC automatically with easier compared to manually and used to make ebook or report although I as a newbie. Make an ebook is very interesting and easy to read. Suitable for those who want to make a Kindle Book and sold it on Amazon KDP. I've bought two products generated from her because I know she produced high quality and easy to understand. I will certainly make a purchase more products from Kay Franklin! She made me happy and I'm sure she will make you happy. The purchase is worth it! Highly Recommended! Thank you so much Kay Franklin for producing this report and you are great! EBooks for Templates used to make eBooks more interesting, convenient and save time. Using only free Software, Open Office Writer is able to make eBooks without expensive costs. I already use it, suitable for writing eBooks and I like it even though I was still a newbie. I am very interested because available all the way to change and also slide presentations for sales. It is very ease my work in writing. The Best Products! with the low price you also get PLR. It is a valuable bonus, purchase worth and packed with useful information. Thank you so much for producing this product!